I have almost twenty years of experience teaching piano to students of all ages and levels. My goal is to foster lifelong lovers and learners of music, while having fun along the way! Weekly lessons consist of a combination of technique, repertoire, and theory/skill study, so that students develop into well-rounded, capable musicians. I recently relocated to Charlottesville from Colorado with my family. Prior to the move, I was on the piano faculty at Colorado College and had an active home piano studio. 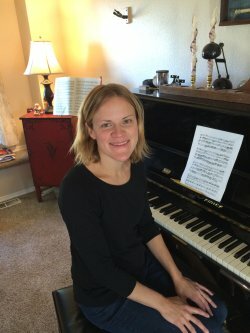 I hold Bachelors and Masters degrees in piano performance/pedagogy from The Catholic University of America and am also a Nationally Certified Teacher of Music (NCTM).